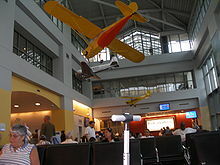 Westchester County Airport ( HPN, KHPN,) is a public airport located in the towns of Harrisson, North Castle and Rye inWestchester County, New York, United States. It is approximately 3 nautical miles (5.56 km) northeast of the central business district of White Plains, New York. It serves the areas of Westchester, a suburban county of New York City, as well as Fairfield County, Connecticut, as the New York-Connecticut state border coincides with the airport's eastern limits. It also serves, to a lesser extent, the New York metropolitan area, as it is located approximately 33 miles (53 km) north of Midtown Manhattan. It is often used by those who wish to avoid the congestion of the other New York City-area airports. According to Federal Aviation Administration records, the airport had 901,831 passenger boardings (enplanements) in 2008, up from 823,478 boardings in 2007.The Westchester County Airport currently has 7 airlines flying to 16 destinations around the United States only.